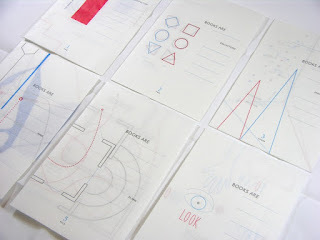 participate in Cause : Effect, a collaborative book project. of reproduction is welcomed and encouraged. to each participant for binding. to submit form. Cost for participation is $25. The Southeast Chapter of the Guild of Book Workers is proud to present the first annual Members' Showcase. Listed below are members from around the Southeast Chapter alongside photos of their beautiful and diverse collections of work. This inaugural Members' Showcase marks the first exhibition of what will hopefully be many more exhibition opportunities to come. The board of the Southeast Chapter hopes you enjoy what our members have chosen to share! 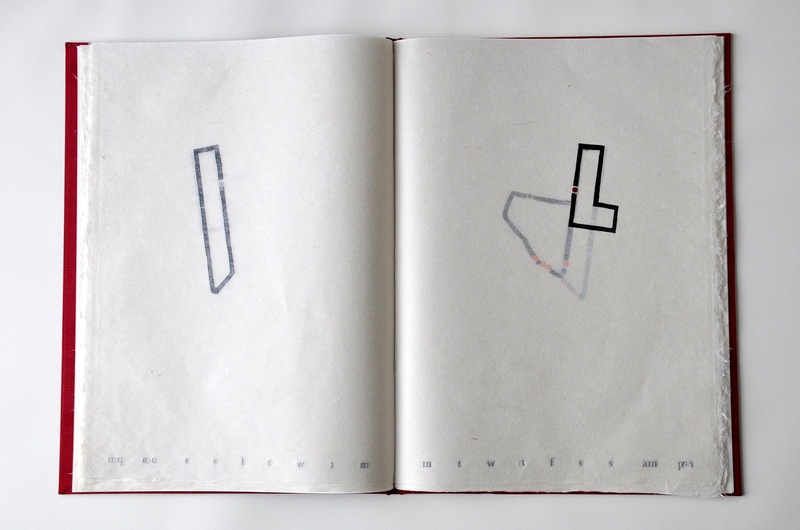 Baulos’s drawings, installations, and books have been exhibited/published both nationally and internationally. His current works are explorations (visual) and meditations (poetry) centering on his ideas of spirituality, love, death, shelter, and hope. Books, because of their exterior/interior format, as well as their sequential ordering, have been a life long fascination. 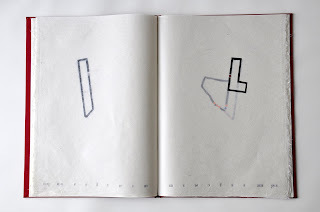 The book as an object allows the viewer to be guided through a thought process as well as evoking time and journey/text and image in an intimate fashion. My books and installations hope to explode process into an embodied visual narrative, a sculpture of our inner life. 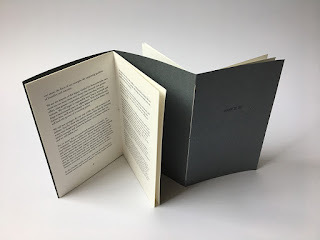 Dorothy Simpson Krause is Professor Emerita at Massachusetts College of Art, author of "Book + Art: Handcrafting Artists’ Books" and "Digital Art Studio". She has been a Visiting Artist or Artist in Residence at the Smithsonian American Art Museum, the American Academy in Rome, the University of the Arts in Philadelphia, the Jaffe Center for Book Arts at Florida Atlantic University and currently on Oceania Cruise Lines. 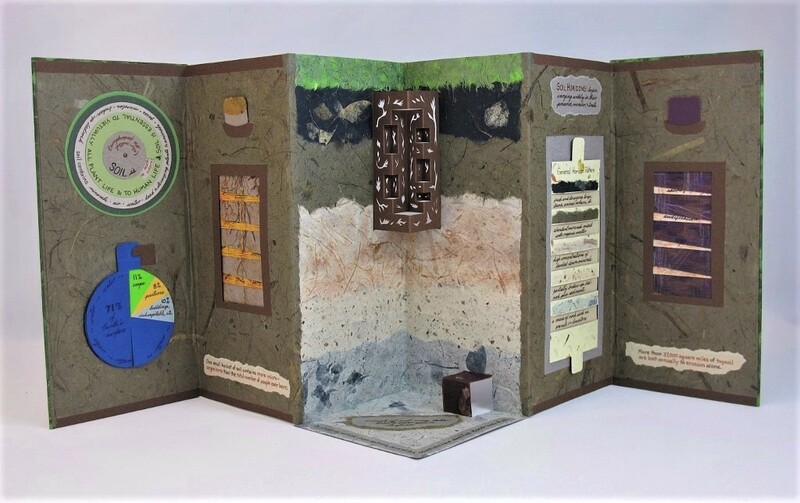 Her work, which is in the collections of more than two dozen museums, combines traditional and digital media in large-scale mixed media pieces, artist books and book-like objects that bridge between the two forms. 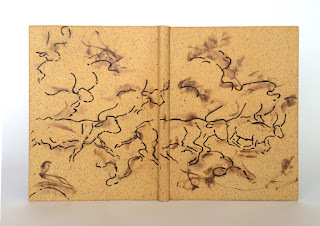 Afloat, This travel journal, completed in the Alban Hills, south of Rome, uses costume plates and a fragile map from “Caesar’s Commentaries on the Gallic War” published in 1888. The plates were collaged over mono prints which I textured to resemble the stones of Roman construction. The 22 pages, 7.75” x 5.75” x .75”, have a drum leaf binding with a replica Roman coin on the cover. The handwritten text, a quote from Shakespear’s play “Julius Caesar”, seemed appropriate since in many ways we now seem to be “afloat” — the title of the book. 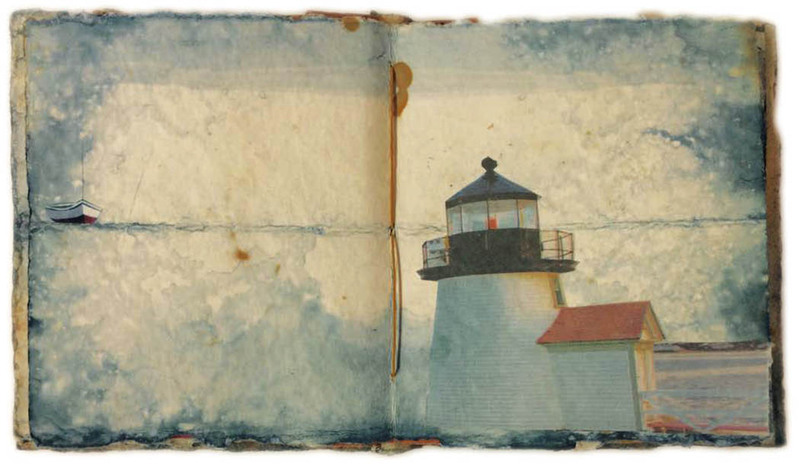 Cape Cod, Cape Cod used paper stained with rust and indigo dye for the pages and cover. Rust colored spacers allowed for incorporating found treasures. Each double page spread, with its spacer, was sewn to the spine with a modified longstitch. An enamel pin, with a map of the area, was affixed to the cover. A horizontal dye line, across the middle of each page, suggested landscapes and seascapes for the collaged images of boats, houses and lighthouses. 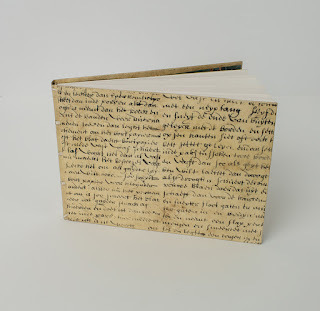 The journal is 6″ x 5″ x .75″ with 28 pages. 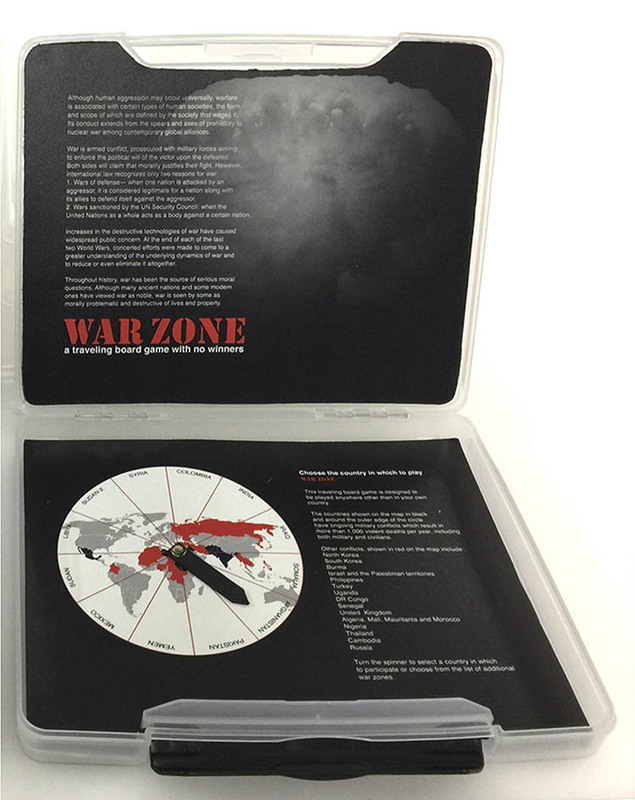 WarZone, “WarZone: a traveling board game with no winner” is designed to be played anywhere other than in your own country. Instructions, game board, spinner board and game pieces are housed in a clear plastic suitcase. Jon Buller has been a practicing hand binder since 1974. 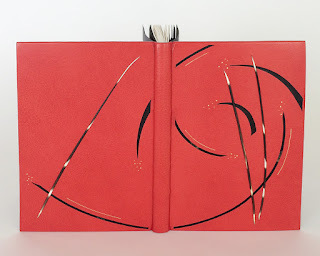 In 1978 he founded the Bessenberg Bindery, a commercial hand bindery, in Ann Arbor, Michigan, which he sold to Thomson-Shore, Inc, in 2010. 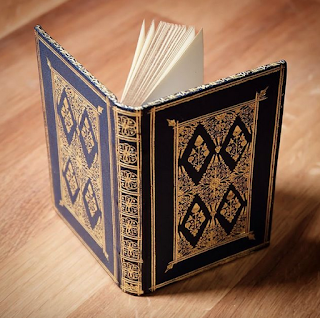 At his studio in Hendersonville, NC, he continues to work for collectors and book sellers, repairing books, and collaborates with artists and printers, making boxes and binding short-run editions in cloth and leather. He has taught at Hollander's School in Ann Arbor, BookWorks in Asheville, NC, and will be teaching later this year at the John C. Campbell Folk School. The I Ching ; Full Chieftan, inlaid with cast sterling and brass, gold tooled. One of an edition of six. 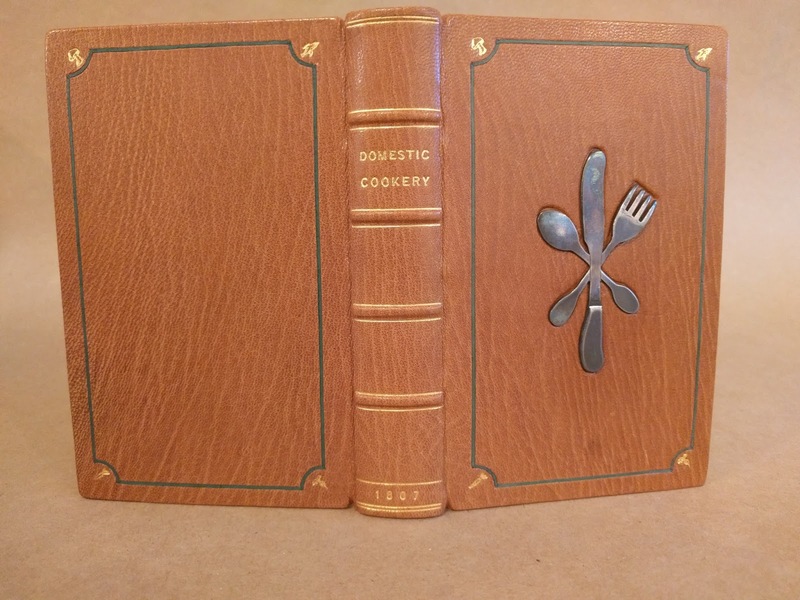 Domestic Cookery, 1807, Mended, resewn, full Oasis, inlaid with leather and sterling, custom dies for ornaments, gold tooled. Sharon A. 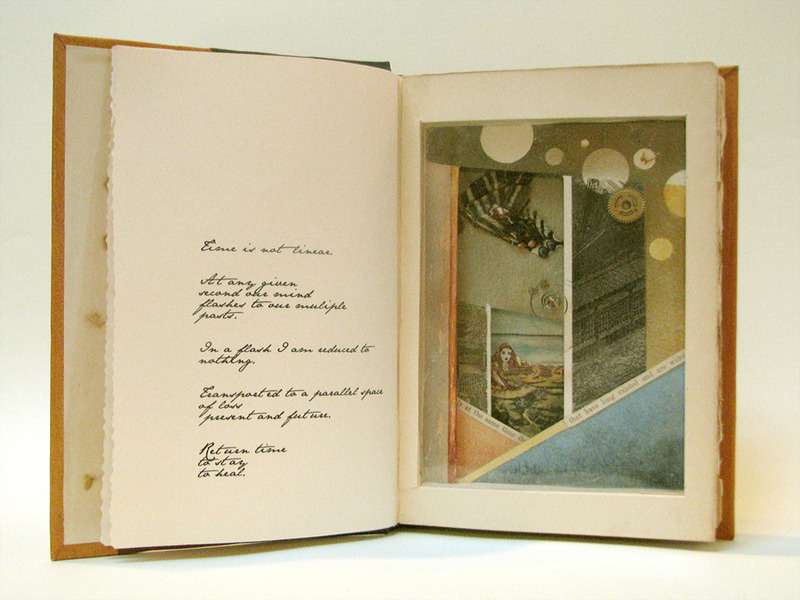 Sharp (Winston-Salem, NC) writes poetry and creates multifaceted artist’s books. Her work has been recognized in volumes 1–2 of 500 Handmade Books, 1,000 Artists’ Books, the Italian fine-arts journal TECA—Exploring the Book as Art (2013), Bind-O- Rama 2014 (online), and Art &amp; Science Collaborations’ “Featured Member” section (online, June 2014). Sharon’s books, represented by Vamp &amp; Tramp Booksellers, are held in numerous universities’ special collections libraries. Drawn to nature-related themes, she has served as an artist-in- residence at two National Parks. 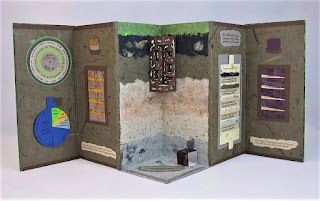 Sharon delights in using nontraditional book forms to enliven both written and visual content. Brien Beidler is inspired by historic bindings and their ability to harmonize fine craftsmanship, quirky yet elegant aesthetics, and evidence of the hands that made them. In his work, Brien seeks ways to create new compositions and juxtapositions of these historic precedents. Brien also makes a limited assortment of specialized hand tools for bookbinding and its related trades. To see more of his work, visit www.beidlermade.com, or his Instagram feed @bhbeidler. Commonplace Book. 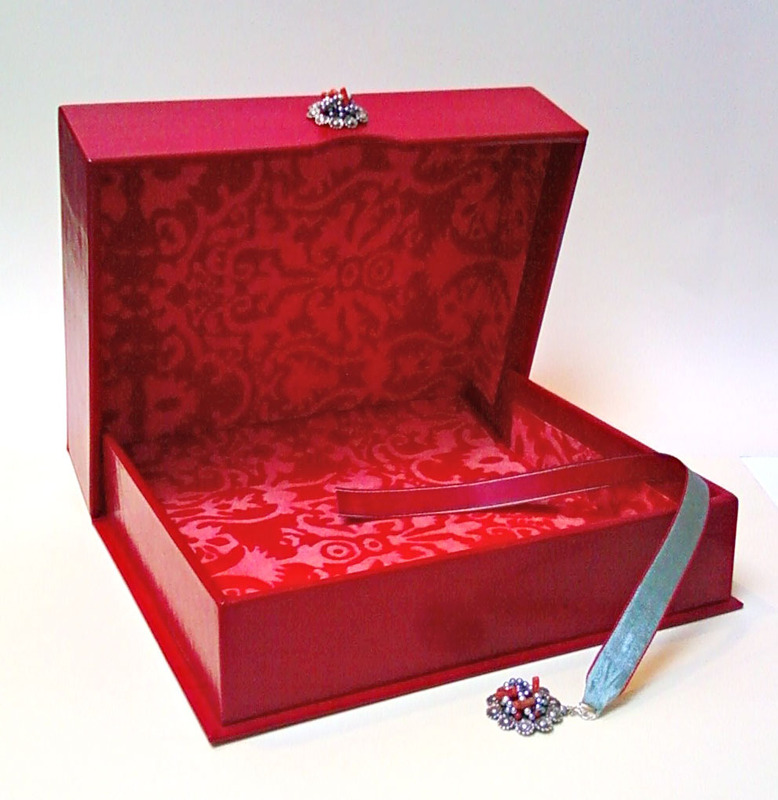 Materials are paper, linen thread and cord, silk thread, millboard, leather, gold leaf. Since at least the middle ages, people have relied upon commonplace books to compile and organize their daily experiences and thoughts. 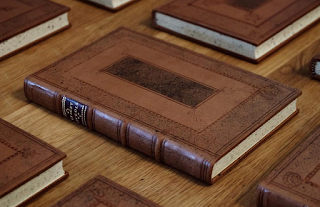 Inspired by this idea, these blank books seek to continue this tradition while exploring and combining different aesthetics and structures from historic bindings. Ellen Knudson produces letterpress printed artist’s books under the imprint Crooked Letter Press. 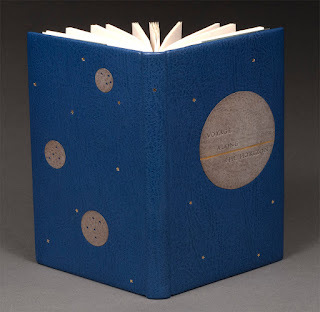 She is currently Associate in Book Arts at The University of Florida and has been a book artist for over 25 years. 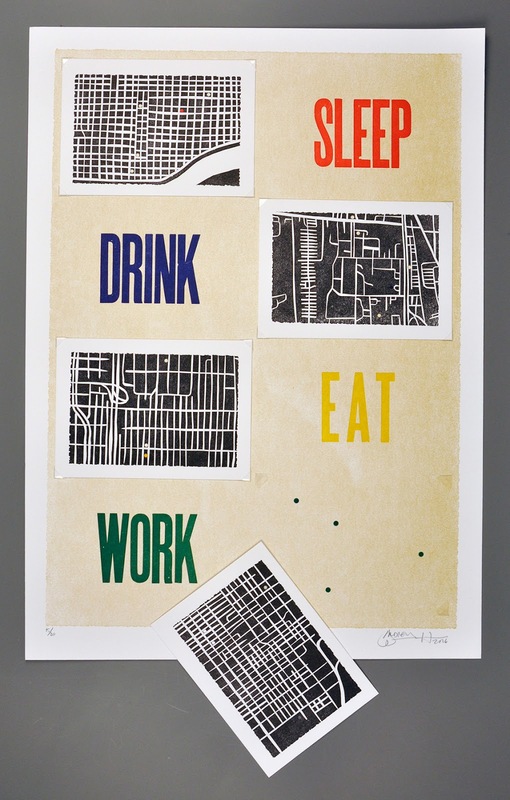 She holds an MFA in Book Arts from The University of Alabama. Her work is in Library of Congress, SF-MOMA, Yale University and many other collections. Intrusion, 2017, A modern bestiary that illustrates the conjured effects of human encroachment on nature and wildlife. Made Up, 2015, A non-scientific science book about the imaginary cellular composition of the human body. 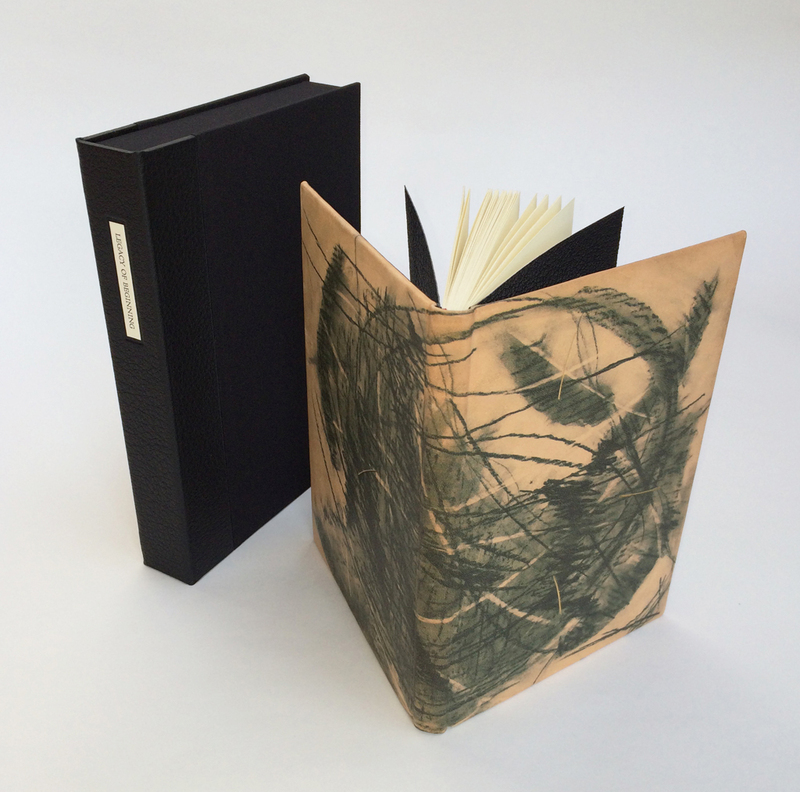 Ingress / Egress, An artist’s book that contemplates the design and function of artists’ books. Ingress / Egress was selected as one of the five finalists for the 2017 Minnesota Center for Book Arts Biennial Prize. 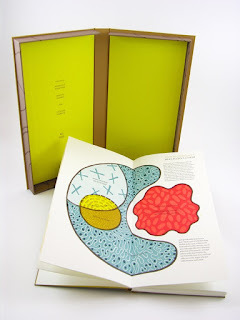 Sarah Bryant produces artist books as Big Jump Press since she started her press in 2005. Her books are held in dozens of collections in the USA and abroad. 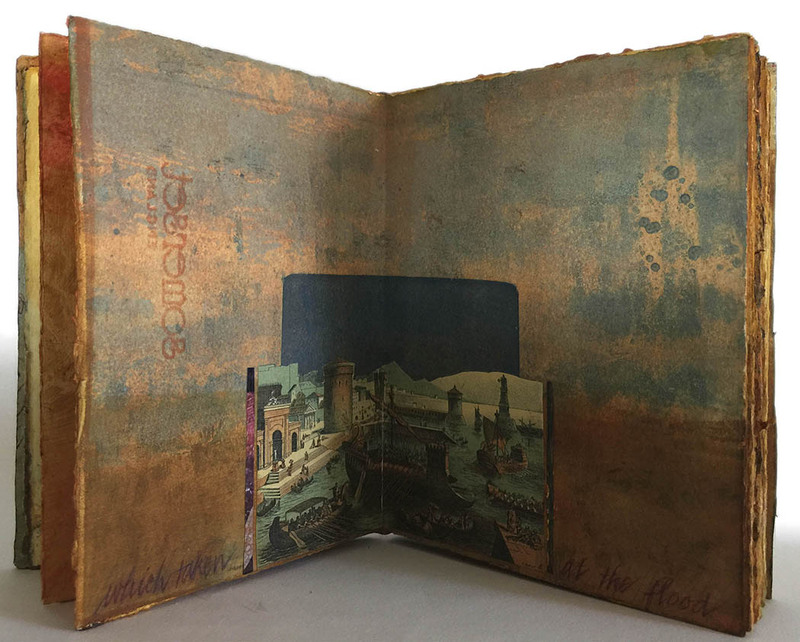 She currently works as an instructor and studio manager for the MFA in the Book Arts Program at The University of Alabama, where she teaches bookbinding and letterpress printing courses. 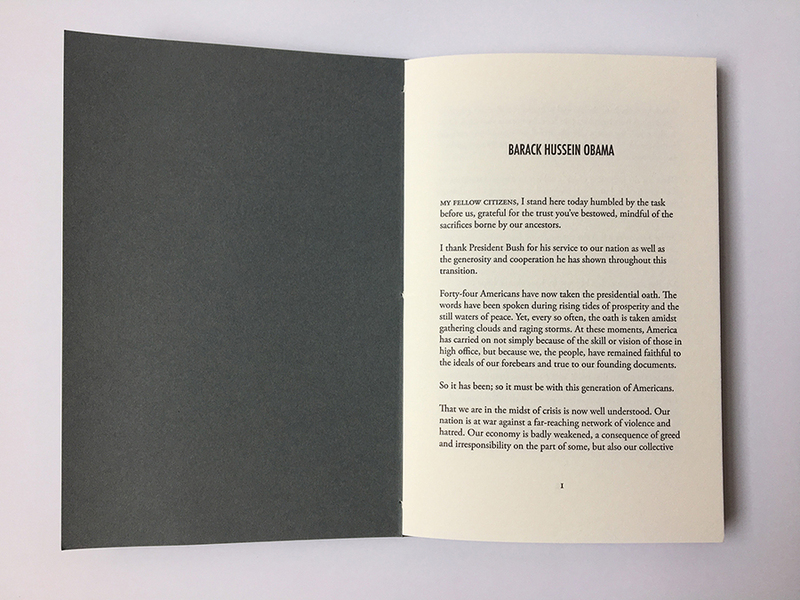 The Address, a 2017 collaboration with Anna Embree, features the 2009 and 2017 presidential inaugural addresses. Letterpress printed from polymer plates. All proceeds from this edition of 50 were donated to the ACLU. A second edition is underway, get in touch if you would like a copy! The artist, Piper Head has a BFA in Sculpture from the University of Miami. She has been a working artist and themed entertainment set designer for over 25 years. 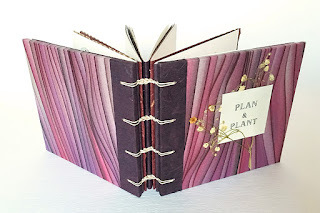 She has been a working bookbinder since 2005, where she trained in the Los Angeles area with Alice Vaughan of Hudson River Bindery and Tini Muira of Long Beach, CA. Her work has been exhibited in USA, Japan and most recently in the OPEN:SET traveling exhibition. 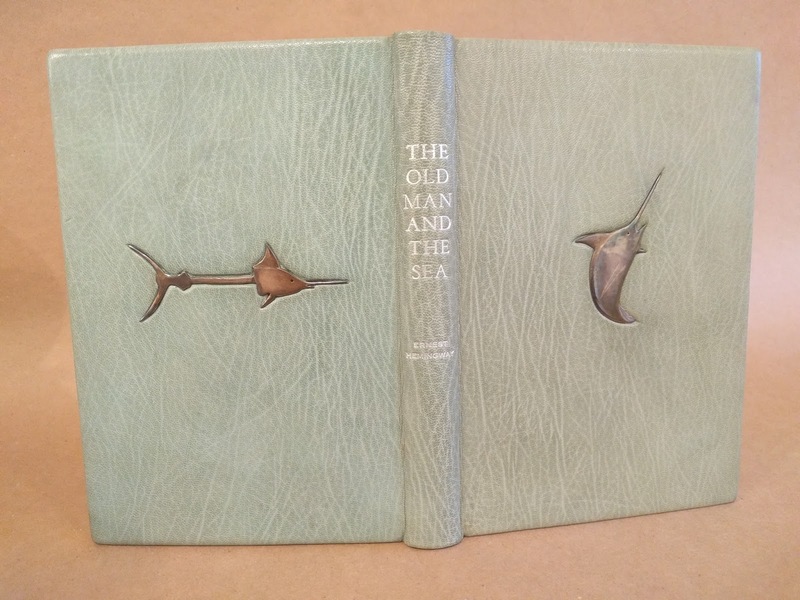 Andrew Huot is a book artist and bookbinder in Atlanta, Georgia. 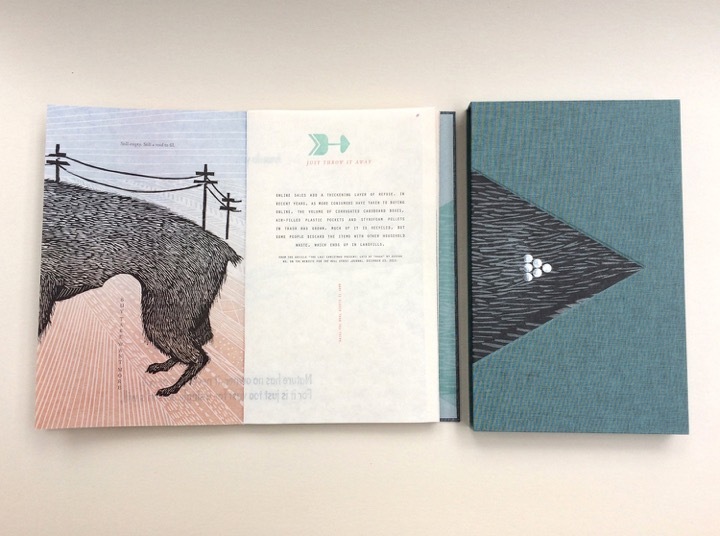 He operates Big River Bindery, a workshop for bookmaking and letterpress printing, book repair, and design. 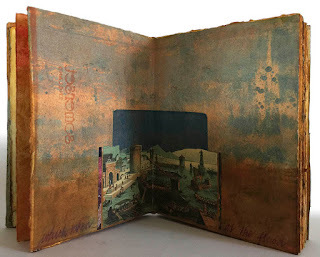 He has a Masters in Book Arts from the University of the Arts, teaches bookbinding and preservation for the University of Illinois. 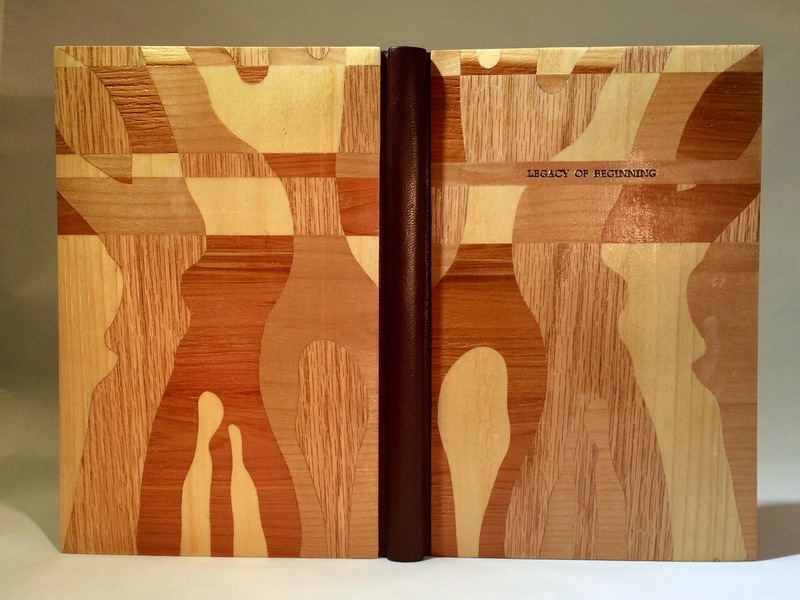 He exhibits his work widely and it is held in over 50 university library collections. His artwork takes his everyday life and uses the patterns, lines, and shapes to create work that is playful and strikes a familiar cord with the viewer. Since she was old enough to understand that illuminated manuscripts were written and illustrated by hand, Audrey has loved all things having to do with the book. 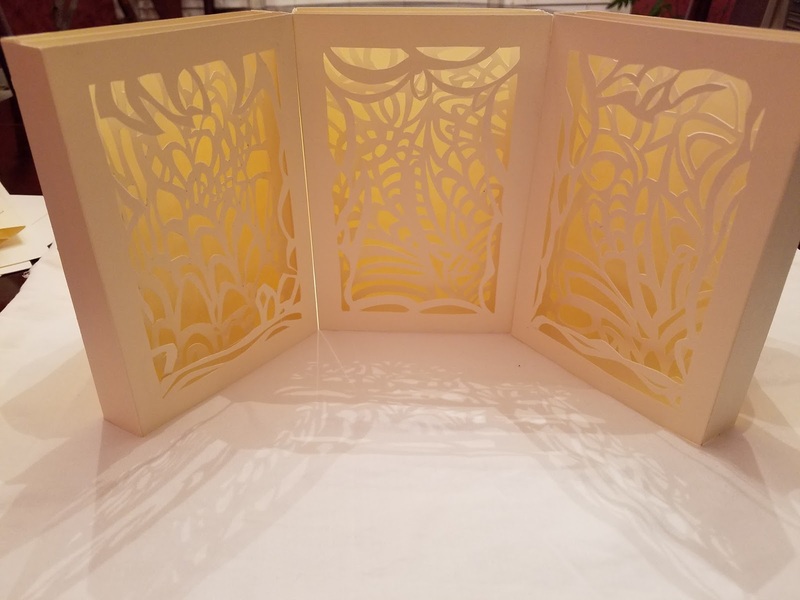 Over the past seven six years, she has developed an art practice that includes making decorative boxes, paste papers, pop-ups, tunnel books and cutting paper into organic forms that produce patterns and light effects. 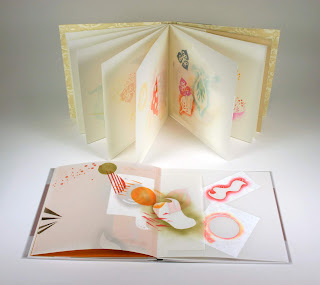 She has taken numerous workshops from various book and paper artists at Penland and through the Triangle Book Arts group, including Kathy Steinsberger, Monique Lallier, Mary Uthuppuru, and Andrea Dezso. 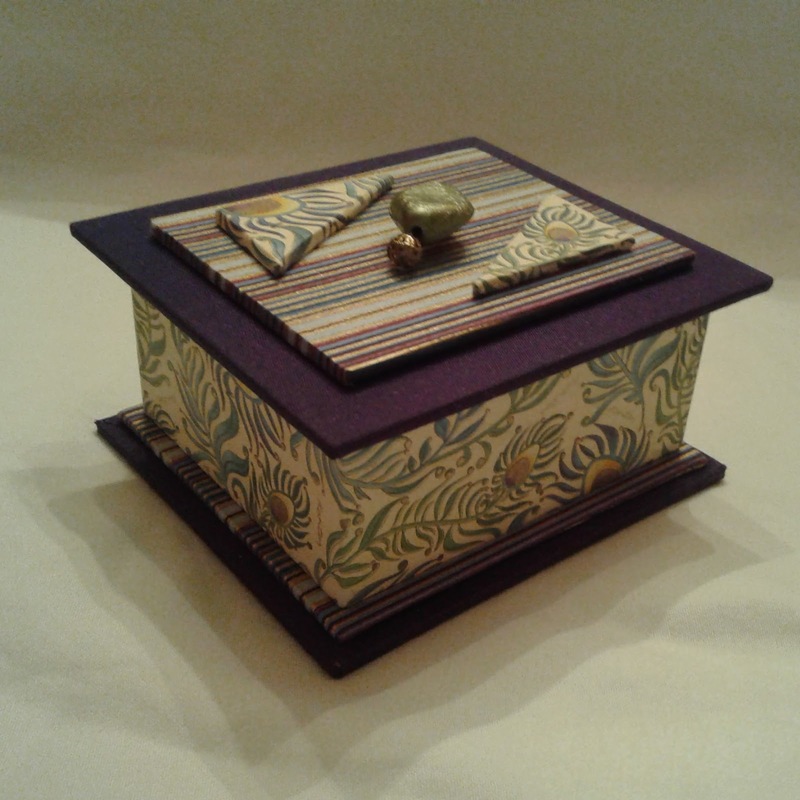 Decorative Box, A small handmade box composed of book board, Japanese paper and book cloth, and beads. 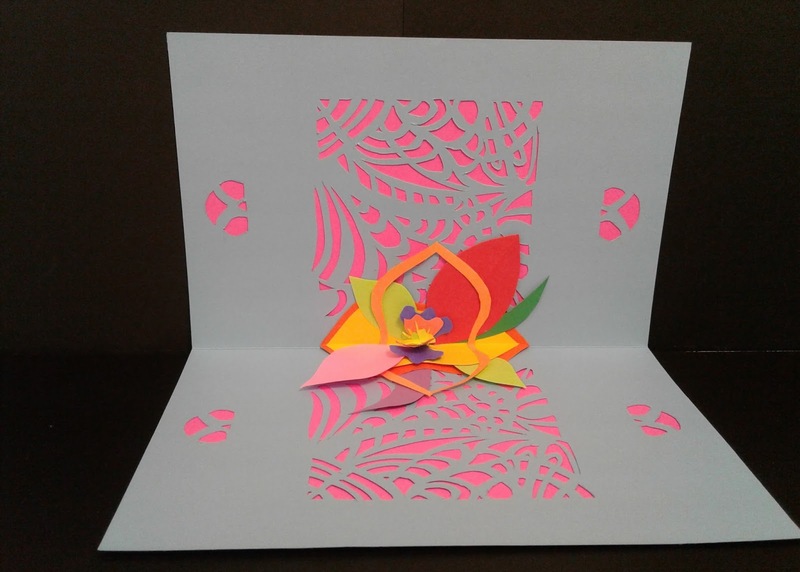 Flower pop-up, This cut paper project used the additive technique to explore placement of cut paper and folding methods to create workable pop-ups. It was made at Penland in Andrea Deszo’s 2-week summer workshop (2017) on cut paper and pop-ups. 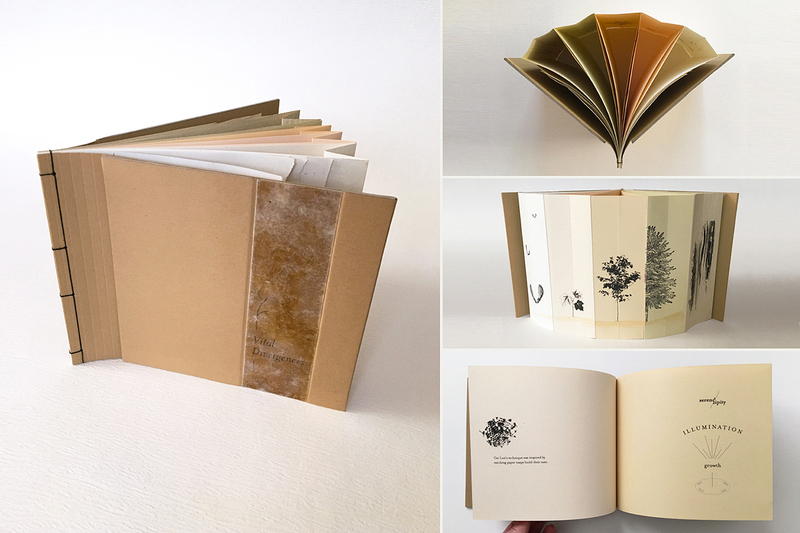 It was included in a group book project that was sold at Penland’s end-of- summer fundraiser. Spider web tunnel book (three panels of five) This cut paper project used the subtractive technique to explore spatial concepts, texture, and patterns. The panels are backlit to emphasize the patterns created by the cutouts. It was made at Penland in Andrea Deszo’s 2-week summer workshop (2017) on cut paper and pop-ups. 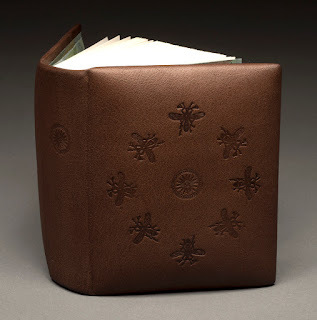 Susan Hulme is a fine bookbinder who lives and works outside of Nashville, Tennessee. 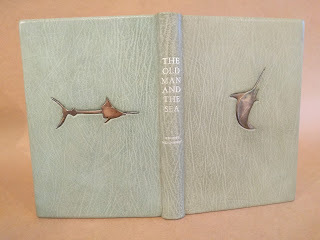 She recently received her diploma in fine binding from the American Academy of Bookbinding. 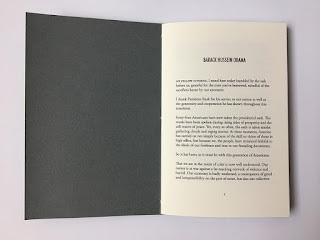 In addition she has been a graphic designer for over forty years and brings extensive knowledge of publication design and production to her BlueMarigold Press. 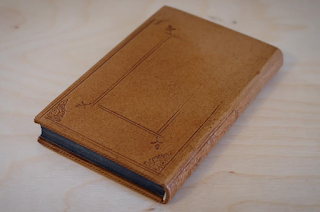 Full leather binding with laced-in boards. 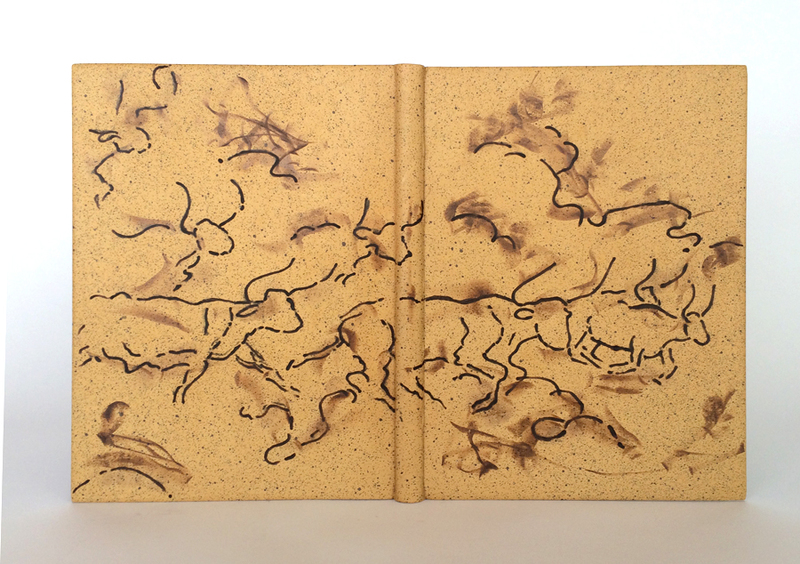 Bound in calf skin printed with binders original charcoal drawing and gold tooling. 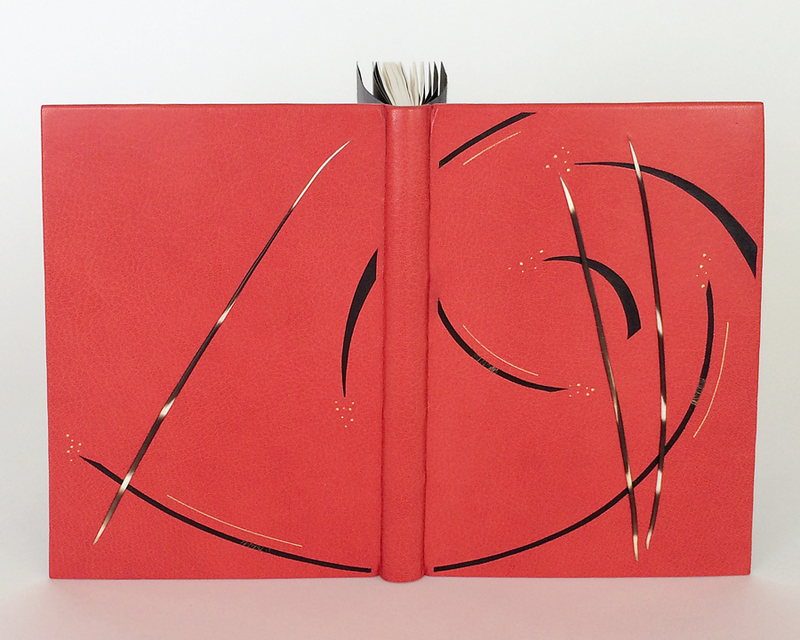 Edge-to-edge doublure and flyleaf in black leather. Handsewn silk endbands. Custom enclosure, Britt Stadig. 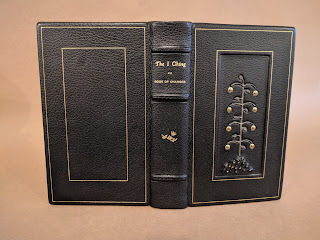 Full leather binding with laced-in boards. Bound in sprinkled calf skin heat etched front and back. 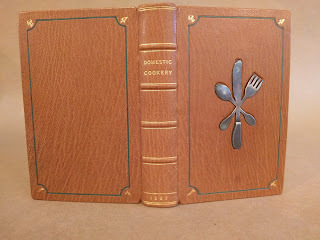 Edge-to-edge doublure in brown goatskin and suede flyleaf. Handsewn silk endbands. Full leather binding with laced-in boards. 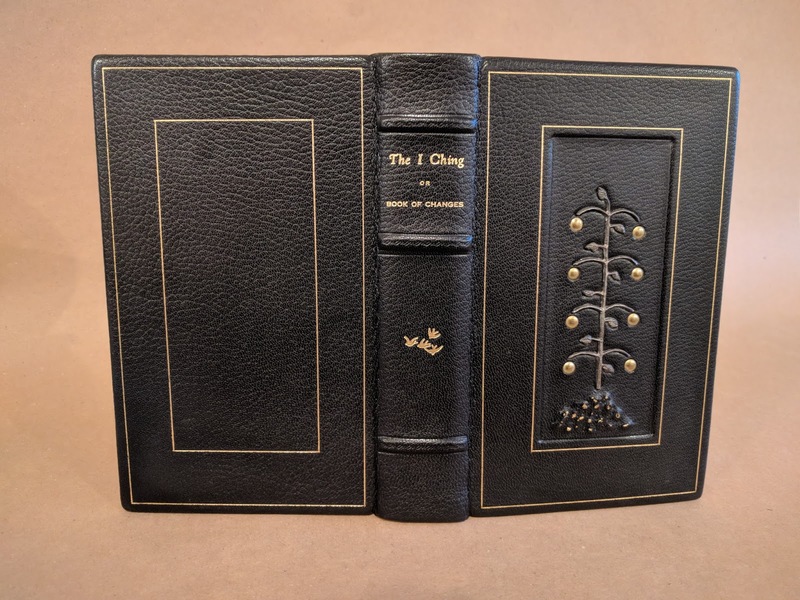 Bound in goatskin with gold tooled arches and dots, inlays of black leather, patent leather and quills. Top edge polished with beeswax. Indian paper endsheets and flyleafs. Handsewn silk endbands. Living Abundantly, Altered book from 1959, vintage paper and collaged elements. Anna Embree is a professor for the MFA Book Arts Program in the School of Library and Information Studies. She has been teaching bookbinding and letterpress printing courses at The University of Alabama since in the fall of 2004. 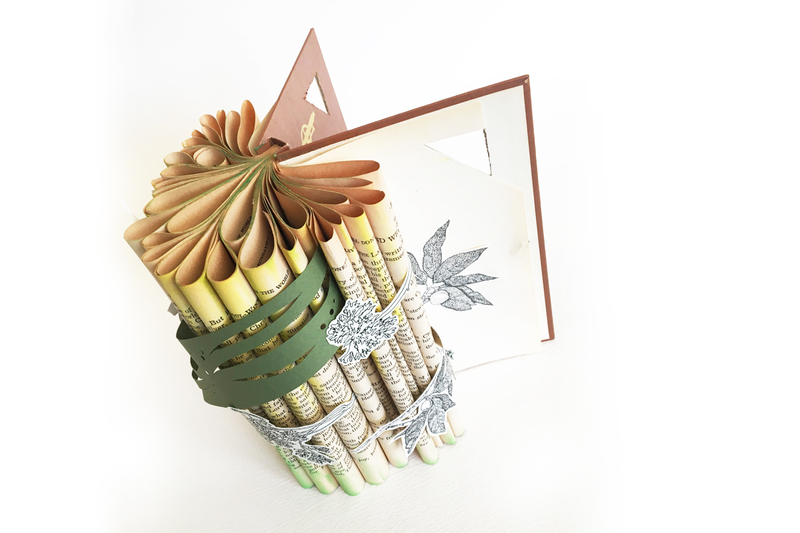 Prior to joining the MFA Book Arts Program, she taught book arts courses for The University of Iowa Center for the Book in Iowa City, IA. Anna teaches courses and workshops in bookbinding, box making, and special topics in book preservation and book history. 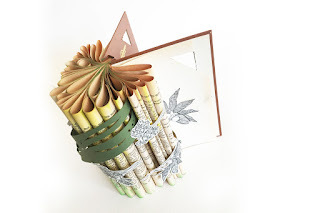 Anna has a strong interest in the physical and material aspects of book structures. She has collaborated with printers and papermakers on limited edition handmade books, and has exhibited widely. Dirck de Bray: vellum laced case binding. 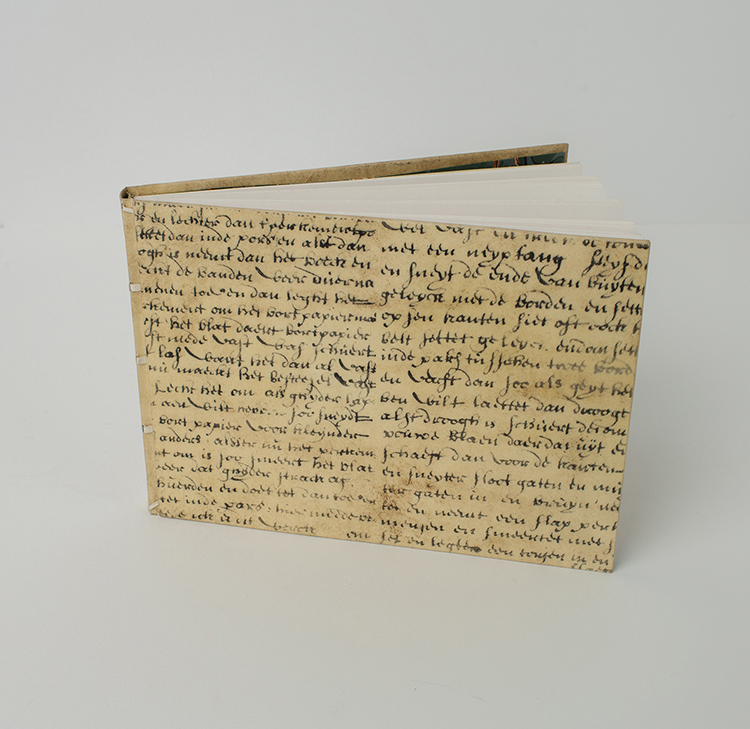 Supported sewing over vellum tapes, marbled paper flexible endsheets, sewn silk endbands; case lined with xeroxed images of the text and covered in transparent goat vellum. Pictorial Webster's: A Visual Dictionary of Curiosities: Sewn board binding with cushioned boards made from laminated museum board. Covering in full goat with blind tooling, sewn silk endbands. 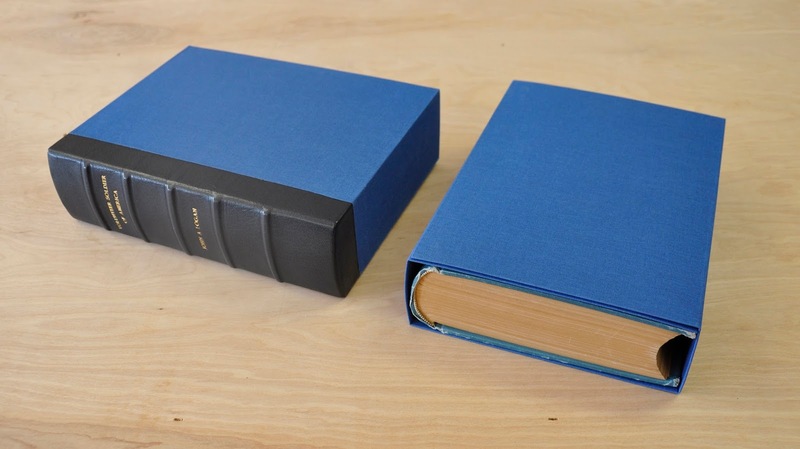 Voyage Across the Horizon: Full leather case binding covered in blue goatskin. Marbled endpapers and sewn end bands. Back-pared onlays of gray leather tinted with white and gold acrylics. Blind and gold foil tooling.